In the past, Ruth has had a high end custom made to order knitting business using natural fibers. A sample of her natural fiber garments can be found in The Survey of Historic Costume, a college text book on the history of dress used throughout the United States and Canada. These garments have appeared in fashion shows across the U.S.A., Paris, France, Africa and Copenhagen, Denmark. Today she is known as the pioneer woman for the 21st century whose curiosity and vision lead to the creation of a new industry. A woman who looked beneath the wild image we associate with bison, to create beautiful objects with a sensuous feel. And beneath is indeed where she looked. Protected by the coarse hair of the American buffalo, Ruth discovered an underlying fleece suitable for spinning into yarn. Hence, the creation of a new fiber developed from shaved bison hair. The result? 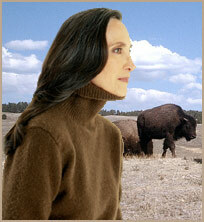 American Buffalo Knits by Ruth Huffman. Imagine buffalo cashmere. It may sound like a fantasy, but it is not. For Ruth, the soft undercoat of the bison offered an untapped opportunity to produce luxury items. "These natural fibers produce a look and feel that exceeds anything that I imagined before I began my research. " says Ruth. This soft, yet strong American buffalo fiber is a de-haired product in which the coarse hairs have been removed from the soft down, leaving a light, durable, soft, insulating and warm product. "This bison adventure has been a very exciting one. The more I learned about this animal and its by-products, which can be some of the softest and most exotic items found anywhere on earth, the more I grew to love the bison and realize what a magnificent American classic we have." Ruth is making a name for herself as the "Buffalo Gal." She is poised to go global with both wholesale and direct marketing of the American buffalo products. Despite using fleece from an animal usually associated with the wild west, her work is mostly traditional and contemporary with an elegant, classical look. Only the rich, chocolate brown color reveals their origin. This is a tale of old world meets new world, a story deeply rooted in the old west, but applicable to life in today's city landscapes. These are stylish urban wraps with all the comfort and luxury a prairie girl could ever dream of. Go ahead, enjoy her story!